There is this Korean after-meal drink called Sujeonggwa. It’s commonly served after dinner because ginger helps your digestion and improves the absorption of essential nutrients in the body. Cinnamon in this drink also helps to control your blood sugar and cholesterol level and kill the bad bacteria in your GI tract so that the gastric juices work normally. So instead of going for sweets or ice creams after dinner, have this drink and maybe one of those snacking power balls. Perfect dessert and so good for your digestion! Traditionally it is made by brewing the cinnamon sticks and sliced ginger at a slow boil and then boiled again after adding either honey or brown sugar. It’s dark brown in colour and topped with pine nuts and slices of dried persimmons. I like its subtle sweetness with a kick of cinnamon and ginger, quite different to Indian chai tea, which has a lot of mixed spices in it. I like it served cold with a couple of ice cubes in summer days. Or a bit of sparkling water to make it fizzy. It is refreshing, cleansing and hydrating! You can definitely make a healthy cocktail or non-alcoholic one with it, too. Depending on your taste, feel free add more cinnamon, ginger or honey. Put all ingredients except honey in a large pot and boil over medium heat for 30-40 minutes. Discard the ginger, cinnamon and star anise. They’ve done their job now. Add honey into the pot and boil for another 20 minutes. Cool it down before you serve. 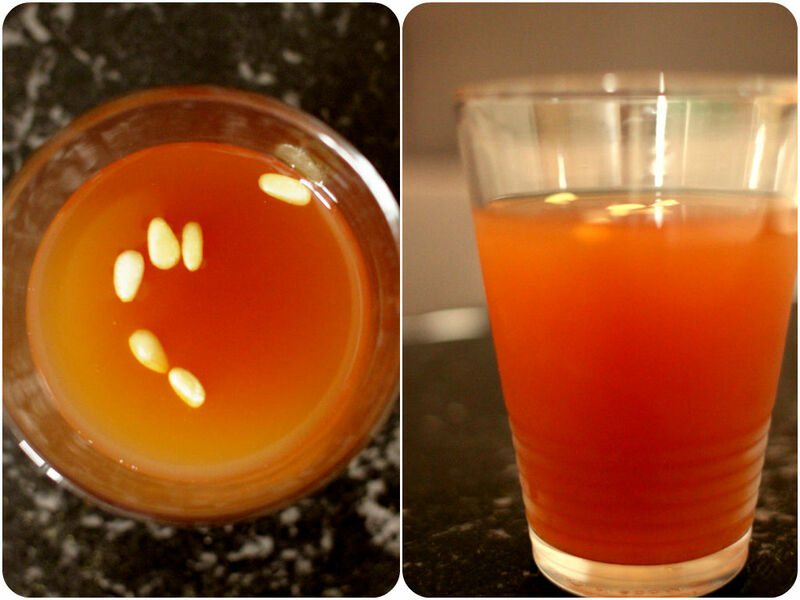 You can top with pine nuts, slices of dried persimmon or dates for garnish.